Are you looking for an electricity monitoring system, with a SIM based wireless broadband connection? If so we have a power monitoring solution for you. By adding a 3G Wireless Gateway device to any of our ONLINE ELECTRICITY MONITORING solutions, you can now easily get the data online. Currently we have tested a 3G wireless gateway using an Optus voice and data SIM card. We have successfully uploaded data from the monitor to the online portal. Only minor configuration of the 3G wireless gateway was required during the setup. The 3G device further allows you to make phone calls by simply plugging in a basic landline phone and besides the four LAN ports, creates a wireless network allowing for the connection of other computer / mobile based devices. 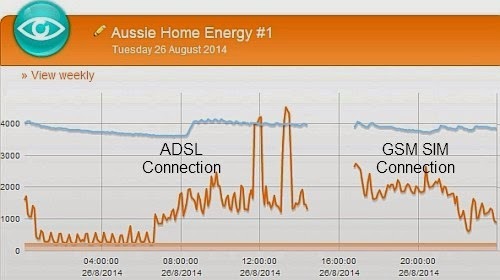 For those of you with no ADSL [often country Australia] you now have an easy solution for getting your electricity consumption / solar power online. You may have looked at a SIM based monitoring option already and due to high cost of wireless broadband fees per month, decided it was not for you. Well we have discovered a 10G data pack costing $100, that lasts for 365 days. Doing the maths this works out to only $8.32 per month with 832MB of data per month. Plenty of data for the simple uploading of your electricity / solar data. We will be adding the 3G devices to our website in due course. In the meantime we are happy to discuss all options with you for your monitoring needs. Q. When Is Standby Power Close To Normal Power?